This revitalizing, silky smooth serum provides heat-styling protection, controls frizz and flyaways, polishes hair, and keeps all tones true. By locking color in and locking water out, you can keep even the hardest-to-keep hues as rich as the day of your service. 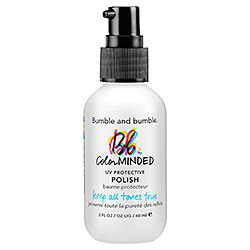 Designed to treat dry or processed hair, Color Minded seals in shine and smooths the cuticle to make hair color glow, fights the horrid humidity, and adds healthy-looking luster and luminosity (just like a finishing coat).